heres the few lures I have from les, cleaning up the shed (not easy!) and took a few pics before re arranging a few things, i have purchased a nice display case to hang on the wall...these lures will go in it soon.....ive got more of les barlows lures but they are in my tacklebox and will stay there. Ive been trying to find ways of judging the eras of les's lures...so far im believing that possibly eye color and stencil pattern indicates age....i think possibly early barlows had either black eyes or blue eyes... more recent years are predominately red eyes? lures i have with writing/signed on them have red eyes.....ones with blue or black eyes have no signature, and looking through other posts this seems consistent except for a small few. This pic shows different eras in the shrimp. bottom lure has blue eyes, the carving in the body is deep and well done...indicating les's younger days when his hands were up to carving the pattern. Moving upwards from the bottom, its easy to see that as time went on les had trouble carving the deep lines in the body, and they become less prominent....ending with the current style pink shrimp at the top which has no body lines carved at all. this lure i purchased from the 1st lure expo, the guy purchased it many years ago from a roadside stall near stanthorpe on the highway. It has a different stencil marking pattern than others ive seen, the overall finish is very good and it has blue eyes abd no signature...indicating early days of les's luremaking. sometime later these 5 lures arrived in my mailbox, each one signed by les from 1 to 5 of 5 only. 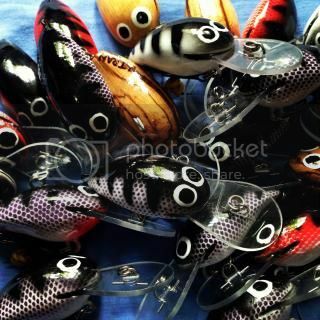 les's lures may not be the prettiest but they are made strong and are outstanding fish catchers. And they have so much character....true Aussie icons. Agree with the last statement mate. It ain't a lure collection until it boasts a Barlow I reckon. Great post Nicho...love the Barlows! Love the Les Barlows! They're an honest, no BS quality lure. Wish i had more of them. I haven't seen one in real life, only pictures. I agree with the quote. Stanthorpe is only a few hours away but I still haven't got there yet. Maybe when our little girl is a bit older. Nicho wrote - This pic shows different eras in the shrimp. Yes that is correct Jason. The flutes became less prominent due to Les's hands until he didn't carve them in at all. But Les uses any paint at any time for eye colour - what ever takes his fancy at the time. Les used to sign his name in pencil because he couldn't find a pen that he could clear over without it running - this is why the backs of his early lures were of a lighter colour. When Les found a pen that didn't run, he started using darker colours on the back (as the fancy took him) (about 10 years ago). About 7 years ago he started putting his $5 price on them. These are the only time lines you can use for his signatures. Point of note though - Les often missed writing on his lures and sometimes wrote the wrong model on the lure. I would like one of those 5 lures though , I got a lure you don't have that Les can't make anymore - let's talk. BEER IS PROOF THAT GOD LOVES US AND WANTS US TO BE HAPPY!!! Look a little closer. I can see 5 midgets in Nicho's stash. I have a couple here with no writing but black dots under the bibs....les did mention why he done that but ive forgotten, something to do with when he was test swimming them i think? That looks an awful lot like a proper collection to me. Great to see. Its easy to appreciate Les's lures when you actually meet the man and spend time in his company. Have been privileged to spend a few hrs with him talking all things lures & fishing. Nah mick....just standard size, ive seen a few other ones and they were just the same. The ones with a black dot were those that he particularly liked the action of. The more black dots the more he liked them. Only saw a couple with 3 black dots though. Les only made, by his estimation about 12 single hookers and less then 40 midgets all up (had to check my notes). Single hook is in my tackle box i think. Ive got the shrimp that has 3 black dots under bib. Theres so many models that are very similiar to each other. I like the names and the reasons he named them what he did. I think steinys got about 40 midgets. HMMMMM, Les must have made more after he said he wasn't going to / couldn't make any more. Going to have to upgrade my notes if that's the case. Heres a few lil piper blanks received from les a while back.....I have painted 2 of the 6 so far, both exactly same pattern color etc....From memory i think i gifted one to horrorhead at the expo? This painted one is going in the post today back to les, ive done a couple of les's blanks before for him, and he really enjoys receiving them back completed differently to the way he does them. I hope he likes this one....old school glass eyes give it a bit of a different look. I wish I had that many midgets. I think I have about a dozen all with 2 hooks. Thanks to this thread, you've reminded me the blank that Les had given me to finish. Yes Nicho, you gave me that Lil Piper . Took a drive out to see Les today. Can you guess what is in bloom at the moment? I picked a heap of those last week out west.....they are flowering in my yard now. Good to see these bought to life Jas, a lot of history here, if we don't post them they would probably never be seen and disappear into that big tackle box in the sky, OR pop up on Flea-Bay with someone else's name on them. Thanks for posting, we don't see Les's lures down here.